Could mammal bladders lead to amphibian-like organ regeneration in humans? A couple of years ago, scientists working at Wake Forest Baptist confirmed that mammalian bladders are capable of a rather unique trick. Unlike other organs, the bladder can completely regenerate itself after experiencing significant tissue loss. In fact, studies on rats showed that a bladder with as much as 75% of its mass removed could repair itself after a mere eight weeks. As amazing as this observation was, however, the scientists were confused as to how this was possible. But now, the same team of researchers think they know what's going on — and their insights could lead to organ regeneration therapies in humans similar to how amphibians and fish regenerate missing limbs. Organ and limb regeneration is not something that's typically associated with mammals. Instead, it's the kind of thing that tends to be seen in such organisms as salamanders, starfish, and zebrafish — animals that are capable of regrowing body parts that have been lost to injury. It's also known that mammalian livers can also repair themselves after experiencing significant tissue loss — but it's a completely different process than what's seen in limb regeneration. When a liver has its lobes removed, it undergoes a process called ‘compensatory hyperplasia' in which the remaining tissue grows to compensate for its lost size. It's more cellular regrowth than true regeneration in which a missing limb or damaged organ has its size, form, and function completely restored. But the bladder, say the researchers, is a special organ in that it is the only one that's capable of this same kind of regeneration. And in fact, the researchers, a team led by George Christ at WFB's Institute for Regenerative Medicine, suggest that bladder regeneration in mammals has the hallmarks of both the cellular regeneration seen in the liver (robust and sequential proliferation of cell types) and that seen in limb regeneration (via blastema formation). In the new study, which was published in PLOS ONE, the researchers showed that the rats' bodies responded to the bladder removal by increasing the rate at which certain cells divided and grew. 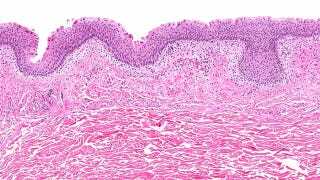 The most significant response happened in the urothelium, the layer of tissue that lines the bladder. Then, as this activity in the bladder waned, it continued elsewhere, including the fibrous band (lamina propria) that separates the bladder lining from the bladder muscles and in the bladder muscle itself. In other words, unlike liver "regeneration," actual functional components of the bladder were being systematically rebuilt. The challenge for the researchers, of course, was to explain the biological mechanisms that are enabling this remarkable process to happen. One theory is that the cells in the bladder lining undergo a transformation and become a type of stem cell that works to regenerate certain parts of the bladder. Another theory is that cells in the bladder lining signal other cells to replicate, and that injury prompts stem cells to arrive through the bloodstream to repair the bladder damage. These insights are particularly exciting in that they could yield future therapies in which other organs can be coaxed into repairing themselves in the same way — including intestines, the spinal cord — and even the heart. Moving forward, the researchers will continue to work on identifying the exact regenerative processes by taking a look at mice. Specifically, they will breed mice who lack specific genes, allowing the researchers to explore how genes and proteins work to affect the regenerative process. Image: vetpathologist/shutterstock.com. Inset images via Wake Forest Baptist.